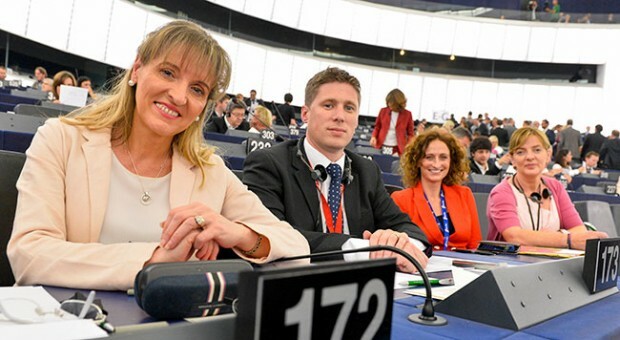 The Sinn Féin delegation in the European Parliament is led by Martina Anderson together with Matt Carthy, Liadh Ní Riada and Lynn Boylan. 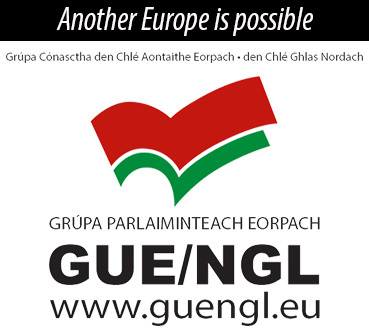 Sinn Féin MEPs sit with the GUE/NGL group in the European Parliament. It is made up of 52 MEPs from across Europe. Through this membership of GUE/NGL, Sinn Féin is represented on the European Parliament’s Brexit Steering Group which meets regularly with the EU’s Brexit negotiation team led by Michelle Barnier. The president of GUE/NGL, Gabi Zimmer, is a close ally of Sinn Féin and represents the group on the Brexit Steering Group. Sinn Féin has been able to use this position to ensure that the issues of Ireland and the border have been placed right at the heart of the Brexit negotiations. As Sinn Féin’s Brexit co-ordinator, Martina Anderson leads Sinn Féin’s campaign against Brexit and for special status in the Parliament. Anderson has highlighted the devastating impact Brexit will have on the Good Friday Agreement. 20 years on from the signing of the historic accord earlier this year, Sinn Féin and GUE/NGL hosted an exhibition in the European Parliament to mark the anniversary and to explain to MEPs the damage the Tory Brexit agenda would do to the Agreement. MEPs from GUE/NGL, as well as MEPs from other groupings, have visited the border region to see how it would be affected by the imposition of a hard border. Matt Carthy has been a vocal opponent of the EU Mercosur deal which, he has argued, would have a hugely negative impact on Irish farming, potentially paving the way for the import of beef from South American countries, chiefly Brazil, with a questionable food safety record. He is also the lead Rapporteur for a key Brexit file on trade in the European Parliament’s Agriculture and Rural Development Committee. McCarthy is also active in challenging the abuses of power by big businesses, opposing tax evasion and avoidance on a special European Parliament Committee. Much of Liadh Ní Riada’s work in Europe deals with fighting for the rights of the Irish fishing fleet and the environment. The recent announcement of plans by the EU to open a new maritime route between Ireland and mainland Europe post-Brexit were welcomed by Ní Riada as an improvement in connectivity and would also provide significant employment. Liadh has also been an advocate of environmental improvements, calling on the EU to put in place urgent policies to tackle the growing environmental crisis in our oceans, particularly the huge volumes of plastics in our waters. As a member of the EU Fisheries Committee, Liadh has challenged the EU to improve its environmental protections. She has also said the polluters should foot the bill to help clean up the oceans. N Riada said that, “To treat this as anything other than an emergency is to condemn future generations to dying oceans and a corrupted environment. Later this year, the EU Fisheries Committee will visit Ireland to see the issues affecting the Irish fishing industry at first hand. The visit came about at the request of Liadh and will involve members of the committee meeting with local fishermen, local authorities, researchers, coastal communities, cooperatives, SMEs and other stakeholders in Cork. Dublin MEP Lynn Boylan has repeatedly challenged and opposed attempts to increase the militarisation of the EU, criticising increased spending on arms, claiming it will lead to more conflict not increased security. “Money is being taken away from farmers and the EU’s poorest regions, yet the Commission has no problem in boosting military expenditure. The EU Commission is prioritising the arms industry over the social and economic well being of ordinary people,” she said. The Sinn Féin delegation in the European Parliament regularly hosts delegations from Ireland north and south to both Brussels and Strasbourg to give a range of groups the opportunity to highlight their concerns and campaigns with EU lawmakers. These visits, hosted by GUE/NGL, often involve meetings with other GUE/NGL MEPs from across Europe as well as other MEPs, and plays a key role in the overall work of the party across Ireland.